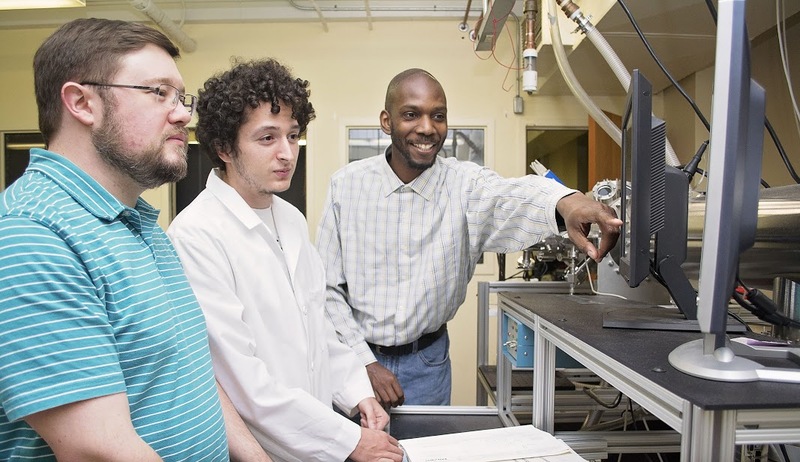 Members of the N.C. A&T Atmospheric Chemistry and Physics Group are working with researchers from 14 other institutions this winter to investigate the little-known dynamics of wintertime air pollution. The project is the Wintertime INvestigation of Transport, Emissions, and Reactivity (WINTER) campaign in the Mid-Atlantic Region. It will provide detailed, aircraft-based measurements to explore how chemical processes in the atmosphere vary by season. Pollution occurs throughout the year, but the chemistry that determines the impact of pollution in the winter has been largely unexplored. Most research has focused on warmer seasons. In winter, for example, short-lived pollutants like sulfur dioxide dissipate more slowly, so they affect wider areas downwind from the source of the pollution. Sulfur dioxide can cause respiratory problems and can turn into acid rain. The uncertainties cover a broad range of issues. “How sensitive are chemical processes in the atmosphere to changes in temperature, water content, acidity, and particle size?” Fiddler said. In addition to Fiddler, the A&T team includes Jaime Green, a doctoral student in energy and environmental systems; and Steven G. Blanco Garcia, an undergraduate physics major. They are part of the Atmospheric Physics and Chemistry Research group, led by Dr. Solomon Bililign, professor of physics. For six weeks this winter, much of their work will be conducted in a C-130 research aircraft operated by the National Science Foundation and National Center for Atmospheric Research. The A&T researchers are responsible for operating the plane’s sulfur dioxide instrument and the reduction of the data. The work includes routine calibration of the instrument, preparation and operation during flights, data processing and quality control. The A&T group also will analyze and interpret the data and write a paper on sulfur dioxide measurements during winter. The plane has been modified to accommodate scientific instruments by doubling the heating and cooling capacity of a standard C-130 military model and more than doubling the electrical power. The study is funded by the National Science Foundation with significant in-kind support from the National Oceanic and Atmospheric Administration’s Earth System Research Laboratory. The University of Washington is the lead institution; other principal investigators are from the NOAA Earth System Research Lab, Georgia Tech, the University of California at Berkeley and the University of Colorado at Boulder. Collaborators include N.C. A&T; Howard University; the University of Maryland, Baltimore County; University of New Hampshire; Los Gatos Research, Inc.; Purdue University; NOAA Atmospheric Research Laboratory; NASA Goddard Space Flight Center; NASA Langley Research Center; and the National Center for Atmospheric Research. This entry was posted in Environment, NSF, STEM, Undergraduate Research and tagged Atmospheric Physics and Chemistry Research, C-130 research aircraft, Earth System Research Laboratory, National Oceanic and Atmospheric Administration, National Science Foundation, Wintertime INvestigation of Transport Emissions and Reactivity. Bookmark the permalink.